The baskets are quick release, so you can unlatch them when you arrive at your destination, and your belongings won't become bait for a thief. Jim Huebener, an engineer, bicyclist and a part-time lobsterman from Cape Elizabeth, was stopped at a traffic light one day when he saw a bicycle ride by with a plastic milk crate attached to the back. That gave him an idea. When he got home, he started tinkering with old wire lobster traps in his garage and developed a removable bike basket that is now being sold on his website, kettlecoveenterprises.com, and in bike shops in Maine, New Hampshire and Massachusetts. A bicycle basket made of old lobster traps. 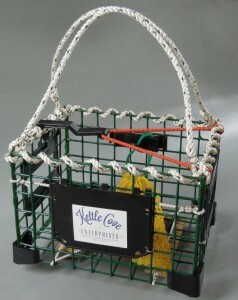 The handles on the baskets are made from marine rope and can be adjusted to carry the basket like a tote. Got a set of keys or cell phone you’re worried about losing? Tuck them into the little bait bag that comes with the basket. 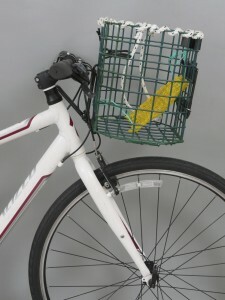 The baskets are probably best suited for commuting and toting around town, not for long-distance riding. Huebener makes baskets for both the front and the back of bikes, and so far they fit every kind of bike they’ve been tried on. The rear baskets require a rear rack to install, which Huebener also sells, or you can find one at your local bike shop. The baskets were road tested in Brooklyn, New York by a filmmaker friend of Huebener’s daughter. The friend made a video of the baskets in action, which is posted on the Kettle Cove Enterprises website. The basket is designed to be easily released so you can take it with you when you park your bike. Huebener sells his removable front bicycle trap basket for $52, the removable rear basket for $70 and a fixed rear bicycle trap basket for $60. The baskets can also be found at Gorham Bike & Ski; Back Bay Bicycle in Portland; Ernie’s Cycle Shop in Westbrook; and in shops in Rockland, Kennebunkport, Portsmouth, N.H., and Cape Cod, Mass. Huebener has a sales rep working with him now to get the baskets into other stores throughout New England. 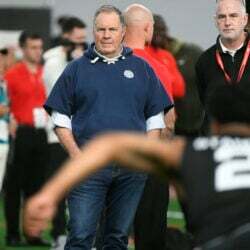 “I think this year they’re going to explode,” he said.